Bumble Beams is a relatively easy game, once you get the hang of it. Although deemed impossibly difficult by some, it is quite the opposite. It's not too hard to gain the maximum NPs (if that is what you are after), but getting those trophies can be very hard. In the game, a few Robot Petpets have somehow gotten lost inside the Recycling Center and without your help they will never make it out. Your goal is to guide the robot petpets down the beams and into the recycling bins, which will guide them to the safety of the RoboPet Shop. As you can see, it's very important that you help these poor petpets. But what exactly are the petpets that need saving? Look no further, they are right here. Now you know the petpets, it's time for the other important parts of this game: the controls, the point-givers and the beams. Playing, again, isn't too hard. You tilt the beams to make the petpets fall into the bins below using their placements to your advantage. You tilt the beams using the right and left arrow keys, but you can only tilt whichever beam the tumbling petpet is currently on. The longer you try to keep a petpet on one of the beams, the more difficult it is to control; at first it will roll slowly back and forth across the beam, but as time goes on it will begin to buck and tilt faster so that the petpet ends up rolling around all over the place and falling off the end. One petpet per bin please! Spring Beam (before and after landing on it) - This beam throws the petpet high into the air if the petpet remains on it for more than 2-3 seconds. Sometimes the petpet will fall into a bin afterwards, but most likely not. These beams may have stars and "mini-Roburgs" near them, so that you would collect them. If you do, be careful; when they spring, they won't reappear! There are three stages in this game, which are named and grow increasingly more difficult as you progress. The Sorter: The first stage it not too hard. Its speed is average and you only need to save about half the petpets to advance each stage. Not too many hard beams to navigate in these levels either. The Grinder: The second named stage is the Grinder and this is where things begin to speed up. The beams are now smaller (the grey ones), 'slippery' (dark blue ones) and the wooden beams and spring beams are common. The Incinerator: The last stage of the game and by far the hardest. The petpets are now aware of the danger they are in and will spin and move around wildly, becoming harder to control. The bins are also much faster and the beams are harder to control. Good luck getting through it! You can drop the petpet off the left or right side if you get desperate; it might not always work, but occasionally you can get lucky and it will fall into a bin. 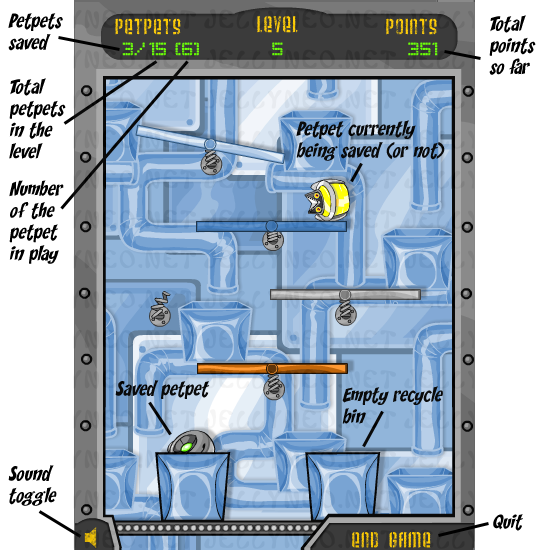 In the early stages of a level, drop the petpets into alternating bins. There is exactly one bin per petpet per level - this will save you having to juggle a petpet on a beam while waiting for a free bin. In the event you do have to balance a petpet on a beam, just keep it on one end and slightly tap the left/right arrow key to keep it from falling. Fast-moving petpets are harder to control. To get a petpet to drop into a bin, wait until it's about to roll off the end of the beam and tap in the opposite direction to level it out. The petpet should drop straight down. Good luck with saving those petpets! We're counting on you!